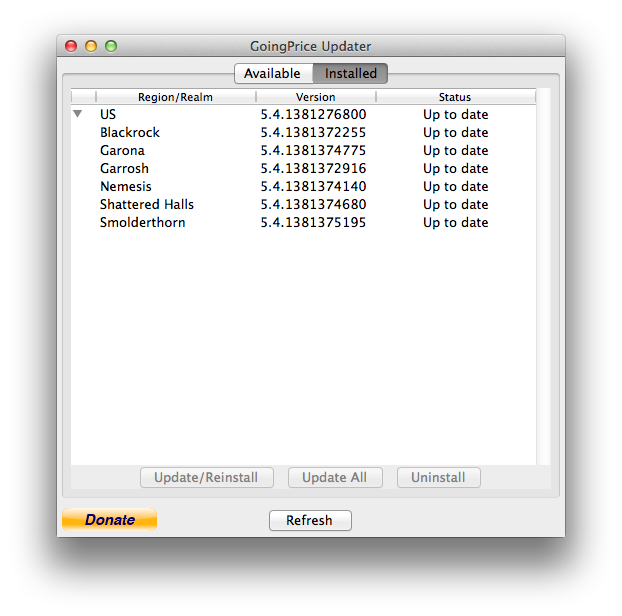 When GoingPrice Updater is launched for the first time, it will attempt to detect the location of your Wow directory. If it could not find your Wow directory, you can manually set it in the preferences. Once your Wow directory is set -- whether detected automatically or manually set -- GoingPrice Updater will determine your region, US or EU, and start up with the Available tab selected which will display a treeview of available addons for your region (right). Assuming you are running Wow in the US region, the treeview will have a parent entry labelled US. Clicking the Install/Reinstall button with this entry selected will install the the GoingPrice_US region AddOn which is responsible for displaying auction house data aggregated over all US realms. Under the US parent entry are its children entries -- one for each realm belonging to the US region. Each corresponds to GoingPrice_US_<realm name> AddOn which is responsible for displaying realm specific auction house data. Notice that only realms on which you've created characters are shown as opposed to showing all 250 realms of the US region. This is because the checkbox, Your realms only, is checked by default when GoingPrice Updater is launched for the first time. Installing GoingPrice AddOns is as simple as selecting one or more entries listed under the Available tab and clicking the Install/Reinstall button. Go ahead and select and install your desired GoingPrice AddOn's then launch Wow -- as you normally do -- to see GoingPrice AddOn's at work! Later on, switch back to the GoingPrice Updater and click the Refresh button to see if any GoingPrice AddOn's have updated. Or, if you have already exited the updater, just launch it again to see if anything has updated. Notice the screenshot on the right shows that two of the installed AddOn's have new versions available. At this point you can either select the new versions and click Install/Reinstall again or you can click the Installed tab at the top to expose a quicker way to update your GoingPrice AddOn's (see below). Click the Installed tab to see a corresponding treeview of your installed GoingPrice AddOn's. Notice that two of the installed GoingPrice AddOn's have a status of "Out of date" -- remember that the Available tab showed that there were new versions available for these AddOn's. Also notice that the Update All button is enabled. No doubt, you know what the last step is (see below). Just click Update All to update all and only those GoingPrice AddOn's that are out of date. Now you can switch back to Wow -- already in progress -- and type "/console reloadui" in the chat window. This will force Wow to recognize the GoingPrice AddOn's that you've just updated along with their updated data.